द्रवहु सो दसरथ, अजिर विहारी ! दुर्वासा : कुँती बेटी ! मैँ स्नान करके आता हूँ। तुम मेरे भोजन की व्यस्थथा कर लो !" कुँती : " जो आज्ञा ऋषिवर ! " कुछ देर बाद दुर्वासा लौटे। भोजन तैयार था परँतु कुछ ज्यादा गर्म था। दुर्वासा ऋषि क्षण मात्र में क्रोधित हो जाते हैं सो उन्होंने भोजन का गर्म थाल, कुँती की पीठ पर रख दिया !
" मैँ इस मँत्र की शक्ति को परखना चाहती हूँ "
प्रसाद स्वरुप, सूर्य देव पिता बने और बिन ब्याही कुँती एक दिव्य बालक की माता बन गई ! अब कुँती क्या करती ? रोते रोते, कुँती ने, लोक लाज के भय से, मानहानि की आशँका से, उस दिव्य बालक को, एक पिटारे मेँ रखकर, नदी मेँ बहा दिया ! यही बालक आगे जा कर, महारथी कर्ण बना ! कुँती का विवाह पाँडु से हुआ जिन्हे, पीलिया या पाँडु रोग था और स्त्री समागम से उनको मृत्यु का भय था उन्होँने अपनी पत्नी कुँती से कहा कि, " हे महारानी कुँती ! स्त्री समागम से मेरी मृत्यु निस्स:देह होनी है। वँश आगे न बढने से मुझे बडी ग्लानि हो रही है ! " तब, कुँती ने उन्हेँ " दैवीवशीकरण मन्त्र " की बात बतलाई ! पाँडु की आज्ञा से कुँती ने, धर्मराज से - > युधिष्ठिर, वायु देव से - भीम, इन्द्र से -> अर्जुन, जैसे पुत्र रत्न प्राप्त किये ! Śrīmatī Kuntī said: O Kṛṣṇa, I offer my obeisances unto You because You are the original personality and are unaffected by the qualities of the material world. You are existing both within and without everything, yet You are invisible to all. “To those who are constantly devoted and who worship Me with love, I give the understanding by which they can come to Me.” If one is actually very serious in searching for Kṛṣṇa, Kṛṣṇa is everywhere. Aṇḍāntara-stha-paramāṇu-cayāntara-sthaṁ govindam ādi-puruṣaṁ tam ahaṁ bhajāmi (Brahma-saṁhitā 5.35). Kṛṣṇa is present within the universe, within our hearts, and even within the atom. So it is not difficult to find Him, but one must know the process by which to do so. This process is very simple, and by the order of Śrī Caitanya Mahāprabhu we are distributing this process to everyone, without charge. The process is to chant Hare Kṛṣṇa. As soon as one chants Hare Kṛṣṇa, one will immediately understand Kṛṣṇa. Similarly, simply by hearing or chanting the verses of Śrīmad-Bhāgavatam, one can be purified. Whatever knowledge exists in the world is present in Śrīmad-Bhāgavatam. It includes literature, poetry, astronomy, philosophy, religion, and love of Godhead. 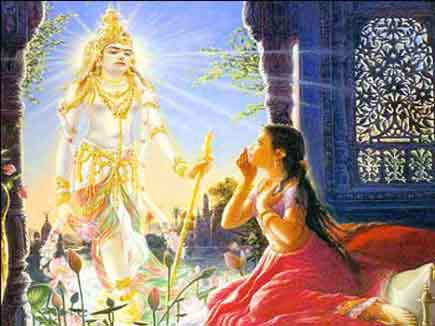 Śrīmad-bhāgavataṁ pramāṇam amalam. If one simply reads Śrīmad-Bhāgavatam, he gains the topmost education, for if one studies Śrīmad-Bhāgavatam he will be well versed in every subject matter. Even if one does not understand a single word of the mantras of Śrīmad-Bhāgavatam, the vibrations themselves have such power that simply by chanting one will be purified. Sṛṇvatāṁ sva-kathāḥ kṛṣṇaḥ puṇya-śravaṇa-kīrtanaḥ [SB 1.2.17]. The word puṇya means “pious,” śravaṇa means “hearing,” and kīrtana means “chanting.” One who chants or hears the verses of Śrīmad-Bhāgavatam becomes pious automatically. To become pious one generally has to endeavor a great deal, but if one simply hears the verses of Śrīmad-Bhāgavatam or Bhagavad-gītā one becomes pious automatically. Therefore it is a rigid principle in every temple of our Kṛṣṇa consciousness movement that there must be a daily class for hearing and chanting. Our movement is meant for training spiritual leaders, but without hearing and chanting it is impossible to become a leader. Of course, in the material world it is possible, but not in the spiritual world. Hearing and chanting waters the seed of devotional service, which develops one’s original consciousness. Namaḥ paṅkaja-māline. From Kṛṣṇa comes the wonderful lotus flower that contains the seed of the entire universe. But He is not the source of only one such flower. Kṛṣṇa is not so poor that He simply produces one lotus flower and then is finished. No. Just as there may be a garland with many flowers, Kṛṣṇa is the source of innumerable universes, which may be compared to a big garland of lotuses. This is God. Yasyaika-niśvasita-kālam athāvalambya/ jīvanti loma-vilajā jagad-aṇḍa-nāthāḥ (Brahma-saṁhitā 5.48). Kṛṣṇa is unlimited. We are very much concerned with this one planet, but Kṛṣṇa’s creation contains an unlimited number of planets. We cannot count how many planets there are, any more than one can count how many hairs there are on one’s head. This is the nature of Kṛṣṇa’s creation. To give another example, on one tree there is an unlimited number of leaves. Similarly, there is an unlimited number of planets, and there are unlimited universes. Therefore, Kṛṣṇa is unlimited. Kṛṣṇa’s navel resembles a lotus, He is garlanded with lotuses, and His eyes are also compared to the petals of a lotus (ālola-candraka-lasad-vanamālya-vaṁśī [Bs. 5.31]. So if we simply think of only this one verse, which describes Kṛṣṇa’s body with reference to the lotus, we can meditate our whole life on how beautiful Kṛṣṇa is, how wise Kṛṣṇa is, and how Kṛṣṇa manifests His creation. This is meditation—thinking of Kṛṣṇa. Dhyānāvasthita-tad-gatena manasā paśyanti ’yam-yoginaḥ [SB 12.13.1]. A yogī is one who always thinks of Kṛṣṇa. Those who think of something impersonal are not yogīs. Their meditation simply involves undergoing more and more labor (kleśo ’dhikataras teṣām avyaktāsakta-cetasām [Bg. 12.5]), and they cannot reach anything substantial. Therefore after meditation they say, “Come on, give me a cigarette. Come on, my throat is now dry. Give me a cigarette.” That is not meditation. Meditation means thinking of Kṛṣṇa always (satataṁ cintayanto mām) and endeavoring to advance in Kṛṣṇa consciousness with a firm vow (yatantaś ca dṛḍha-vratāḥ).